Continuing our spotlight on the importance of our rivers for transport, Ron Creber, curator at the Ballina Naval & Maritime Museum, talks about the inland river system on the New South Wales north coast. You may or may not have noticed that the major cities, on the Mid North Coast and Northern Rivers of New South Wales, are inland! On the Tweed River we have Murwillumbah, the Richmond River, Lismore, on the Clarence River, Grafton, the Macleay River, Kempsey and on the Manning River, Taree. The early settlers weren’t into surfing and the ‘good life’ by the coast. They were looking for good arable land for survival, and, in this virgin land, good arable land was inland. The only way to reach these remote areas was by sea, and the network of rivers and creeks that fanned out from the coastal river mouths. Shipping companies were usually set up by entrepreneurs and farmers on each of the above rivers. Over time, through amalgamations and takeovers, one company — the North Coast Steam Navigation Company — became the major player. This company served all the river ports and the sea ports of Coffs Harbour and Byron Bay. Over its 110-year history, 1855 to 1954, the company owned and operated more than 100 vessels. 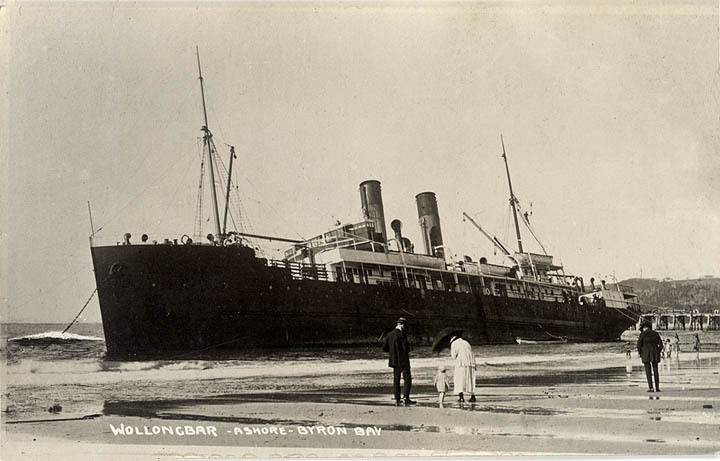 Many were household names: Wollongbar (1), wrecked at Byron Bay in 1921; Wollongbar (2), torpedoed by a Japanese submarine off Crescent Head in 1943; Nimbin, another war victim sunk by a German laid sea mine near Norah Head; and Gunbar, the first ship attacked during the first Japanese air raid on Darwin on 19 February 1942. As the rail system pushed out from Sydney and Newcastle, the days of coastal shipping were numbered. The war losses and the shortage of shipping after the war didn’t help matters, and also the Waterside and Seamen Union’s demands cut profit margins. The final nail was driven home when the state-owned railways cut freight rates to such ridiculous levels that competition was impossible. The North Coast Steam Navigation Company filed for voluntary liquidation in 1954. The river systems were the life blood of these new settlements. Apart from the ocean going vessels, the rivers were home to droghers (tugboats), passenger ferries, floating shops, cream boats and barges. The major port of the Northern Rivers was Ballina, at the mouth of the Richmond River, and in its heyday was the third busiest port in New South Wales (second by tonnage). The main export was red cedar, a tree prized for its beautiful colour, fine grain and durability. Because of the price it commanded, it was called ‘red gold’ by the cabinet-makers of Melbourne during the Victorian gold rush. As the land, known as The Big Scrub, was cleared by the timber getters, the land was opened up to dairy and pig farming, and cane growers. From the beginning, boat building was a major activity on the rivers. On the Richmond River many yards were established, building trading ketches, ferries, workboats, droghers and fishing vessels. The Ballina Slipway and Engineering Company was one of the first and the last to operate on the Richmond. Situated in the heart of town, under the stewardship of S G White Pty Ltd, the yards became a major manufacturing concern in the town. This yard specialised in ship construction and repair, and at its peak in the 1970s and 1980s, employed more than 120 people. Wood and steel boats of all kinds were constructed, fishing vessels, large ocean going tug for the mining industry, and island trading vessels for the far flung Pacific nations. During World War II, repairs were carried out on US patrol boats and other war weary vessels, operating in the northern waters of Australia. In the 1980s, major restoration works were carried out on the Krait (famous for its behind the lines commando raid on Singapore Harbour), also the much-loved Manly ferry, South Steyne. In 1989, once work on the South Steyne was completed, the yard closed its doors. Only the foundry section remained trading under the name of Metalcast Australia. An enduring benefit of Ballina Slipway and Engineering Company remains in the town. 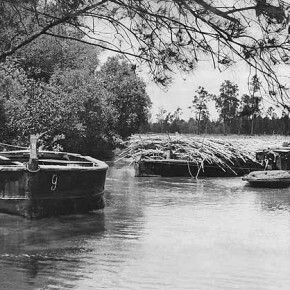 After the end of World War II, many tradesmen from the Royal Australian Navy headed north to Ballina to work at the slipway. Keeping in touch with their mates, they exulted the benefits of living in paradise; soon Ballina had the largest Naval Association sub branch in non-metropolitan Australia. In 1859 George Easton was appointed the first pilot to the Port of Ballina. More than 120 years later, in 1982, the last pilot, Ron Horricks, was withdrawn and the port closed. The Pilot Station compound, on the banks of the Richmond River, was handed over to the Ballina Shire Council. Local not-for-profit organisations were invited to take up the opportunity to occupy rooms in the old Pilot Cottage. The Naval Association Ballina Sub-Branch was one organisation to take up the offer, and occupied one of the rooms. As other tenants moved out, the Naval Museum expanded into a second room, then a third, and finally the whole ground floor. The bigger the museum became, the more the booty came flooding in from the local naval community. Sailors have always been hoarders. Pilfering (a more acceptable definition to stealing), especially from other ships, was a form of sport in the world’s navies. In 1992 the council sold the cottage to make way for the new Information Centre and Library Complex. The old Information Centre and Maritime Museum, which featured the only remaining raft of the 1973 Las Balsas expedition was now vacated and offered to the Naval Museum. In 1993 the Ballina Naval & Maritime Museum was born. Since its modest beginnings in the cottage, it has continued to grow, as has its reputation of being one of the finest museums in country Australia. In March 2007 an extension doubling the size of the museum was opened to the public. This extension was made possible by the financial support and goodwill of the Ballina Shire Council, funding from the Department of Transport & Regional Services, and also by the energy of the volunteers who comprise the Ballina Naval & Maritime Museum Inc. Faithful to its roots the museum is still a volunteer-run affair, opening seven days a week. 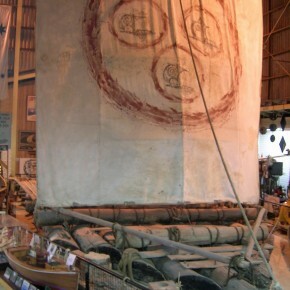 In 2008 the Ballina Council in an effort to save the riverboat Florrie, moved the vessel from the adjacent river bank to a covered compound at the western end of the museum building. Florrie was built at Blackwall, New South Wales, in 1880 and is one of the oldest surviving timber craft in Australia. Florrie spent most of its 95-year working life on the Richmond River, and is representative of a class of vessel that played a vital part in the economical development of the Richmond region. 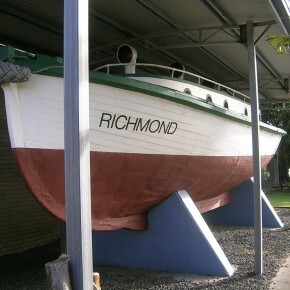 Another local vessel, the PV Richmond, featured at the entrance to the museum, served as the pilot vessel on the river for more than 50 years. Florrie and Richmond are both in need of restoration and preservation management. To achieve this end the museum has been lobbying the Ballina Shire Council to approve a further extension to bring the Richmond into the museum and the weather proofing of the Florrie compound. An architect has been appointed by the council so we are expecting a favourable outcome. While our museum is not old as museums go, over the years we have acquired a well-stocked library, featuring some rare publications that we have found vital in our research efforts. The museum encourages the public to use this facility as well as the many documents filed at the museum. The Ballina Naval & Maritime Museum is open 7 Days from 9am – 4pm on Regatta Ave, Ballina. You can phone (02) 6681 1002 for more information.